New EOS and BTC.USD strategy — February 12, 2019. It’s been a while since we have promised some new crypto strategies and we finally managed to find some free time to keep our words. We have both a brand new strategy on EOS and an update on the BTC.USD one that includes short positions and that will involve more trading. Since the beginning of the year, the crypto markets seem to consolidate their rise initiated early December. After an explosion of volumes at the trough, we saw a rapid increase to an intermediate top early January that our models managed to capture on the ETH.USD pair. Since then, the markets have consolidated with rapidly decreasing volumes. This is the right set up for further gains in the months to come. We said since the beginning that we would try to expand our strategies beyond the BTC and ETH universe and this the first attempt to propose a strategy on a new crypto asset EOS. This is now a well-established cryptocurrency and an interesting one going forward. 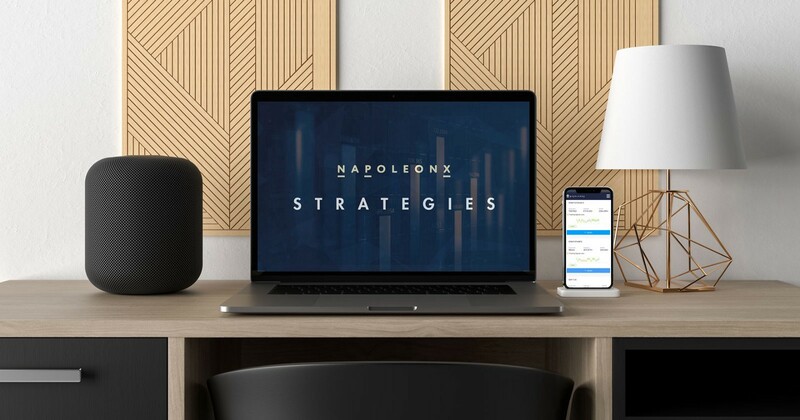 The strategy is the aggregation of 5 primary strategies, all based on short term price movements combining both trends following and mean reversal strategies. For each of these strategies, the positions are either -1, 0 or +1. Given the weights allocated to the 5 strategies and a decision not to have any leverage on our resulting strategy, the signal will have different mode between -1 (max short) and +1 (max long). A signal of +0.5 would be equivalent to have before position with 50% of the allocated amount to this strategy. If this signal would then move to -0.2, that means that one would have to sell EOS.USD pair for 70% of the target amount allocated to this strategy. As can be seen, the strategy did not have a great run recently. We developed it several weeks ago and have decided not to overfit it. So now may be a good time to try and test it. So far, we had a BTC strategy that was based on 2 signals: a weekly trend following strategy and a daily “buy the dip” strategy that has generated very few signals. We searched for a while to add a strategy that allowed short positions and that would increase the trading frequency. We are quite happy to have found such a strategy that is complementing quite nicely the 2 first ones. As always, the resulting strategy will not have any leverage. The way the aggregation works is that we are adding the positions for the 3 strategies. We then cap the resulting position by +1. 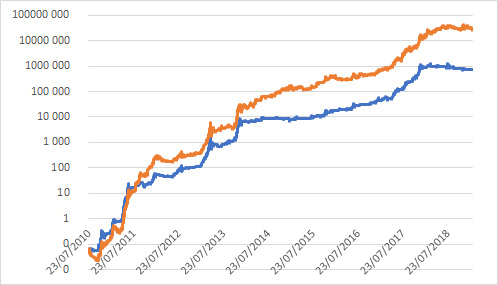 In blue, you can see the old BTC.USD strategy and in orange the new one. 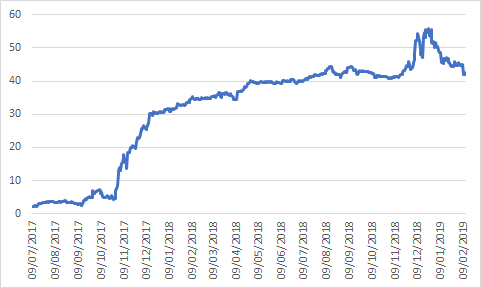 Please note that we have used a log scale to keep the graph “under control”. As you can see, the difference is significant: the new strategy delivers 38x more performance than the previous one over the selected timespan (a little more than 740,000 vs just under 28,300,000 with an initial value of 0.06). The enhanced BTC.USD strategy will replace the previous one in the usual Signal tabs. Remember that you must be logged in and have registered your tokens on the platform to access the signals. If you haven’t already done so, follow the instructions here. The process doesn’t take more than 5 minutes. At last, regarding the soon to be available bots, we are still working on this development days in days out. We will soon announce this feature, its technicalities and the pricing model. So please be a little more patient. What can be said at this time is that we have selected Bitmex, Kraken, and OKEX platforms for the execution of our bots. We wanted to have access to top-notch Exchanges, that allow both long and short positions on margin and that offer decent volumes. It is likely that we will provide only the service for the BTC / ETH / USD allocation model initially with a view to expanding this scope rapidly. A daily fixed fee will apply for the use of our bots based on the managed amount. To have access to this service, you will need to hold and register NPX tokens. A new section in your account will be added, and you will need to buy credit to use this service. The price will be based in EUR, but you will only be able to buy these credits in USDT, ETH or BTC. Execution for the bots will not start before the release of the signal to your account. So for Silver accounts, execution will not start before 30mn post-midnight UTC. For Gold members, execution will not start before 15mn past midnight UTC. For Platinum members, first executions will start at midnight UTC. Once again, we will manage a queue line for all subscribers of the same service in order to organise timing when orders hit the market. Randomness will be used to prioritize orders, and they will be split into small amounts to remain as much under cover as possible. All orders will be executed on your own account. In the meantime, trade wisely.